The Bureau of Labor Statistics (BLS) released their monthly Consumer Price Index (CPI-U) and Inflation report on May 22nd for the year ending in April. This resulted in the 4th month in a row where the numbers were negative (i.e. deflationary). Although the month of April itself saw prices increase 0.20% the net effect for the whole year was still -0.20%. We have seen a steady decline in inflation since May 2014 when it was 2.13%. 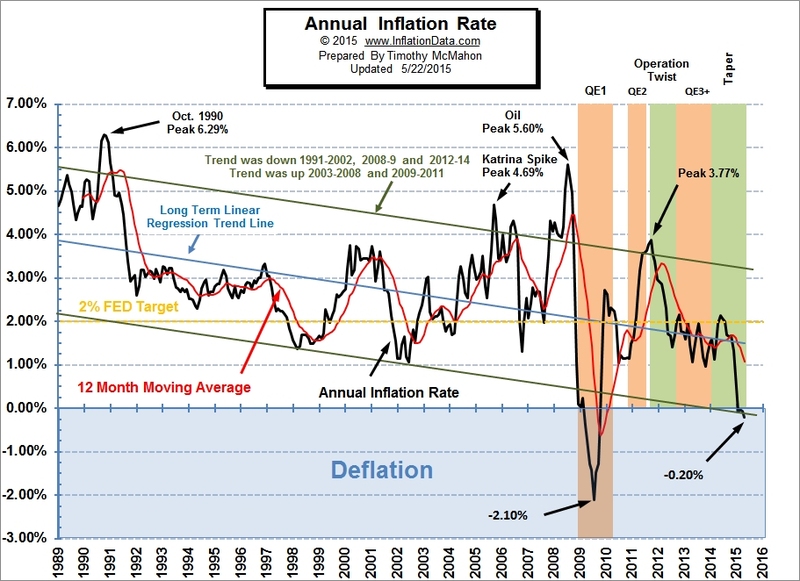 The progression included June at 2.07% then July at 1.99%, August was 1.70%, then September and October were both 1.66%, November was 1.32%, December was 0.76% and then January was a deflationary -0.09%, February was -0.03%, March was -0.07% and finally April was -0.20%. With a rebound in gasoline prices in progress, it is possible, that the downward trend will subside and May will blip up slightly. Over the last month some of the key movers were Fuel Oil which fell a whopping seasonally adjusted -8.4% in the month of April and a non-adjusted -29.1% over the whole year. Natural gas fell “only” -2.6% for the month but -16.3% for the year. Food rose 2% for the year while Hospital services rose 4.8% but airfares fell -7.5%. All items less food and energy rose 1.8% and food rose 2% but that was more than offset by the -19.4% fall in energy prices. 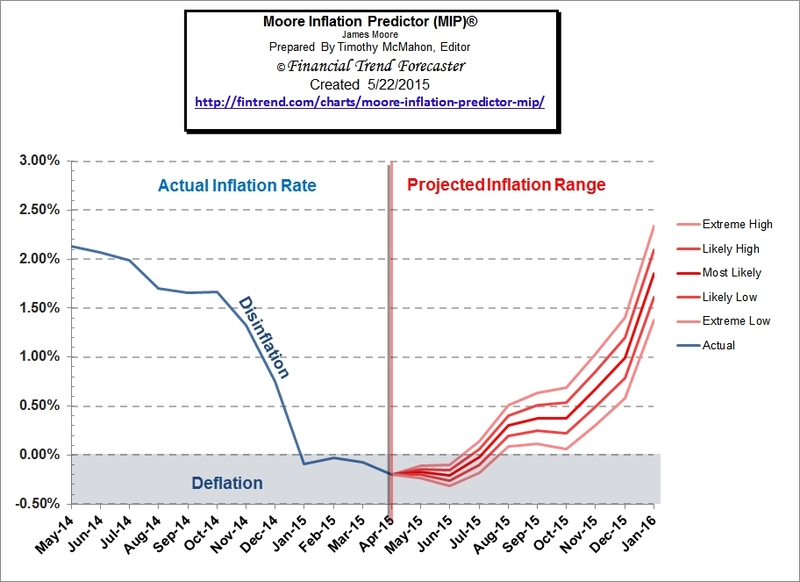 In our January Moore Inflation projection (MIP) (based on December data) we projected that inflation would drop from around 3/4% to Zero or below for the 12 month period ending in January 2015 and that is precisely what happened. 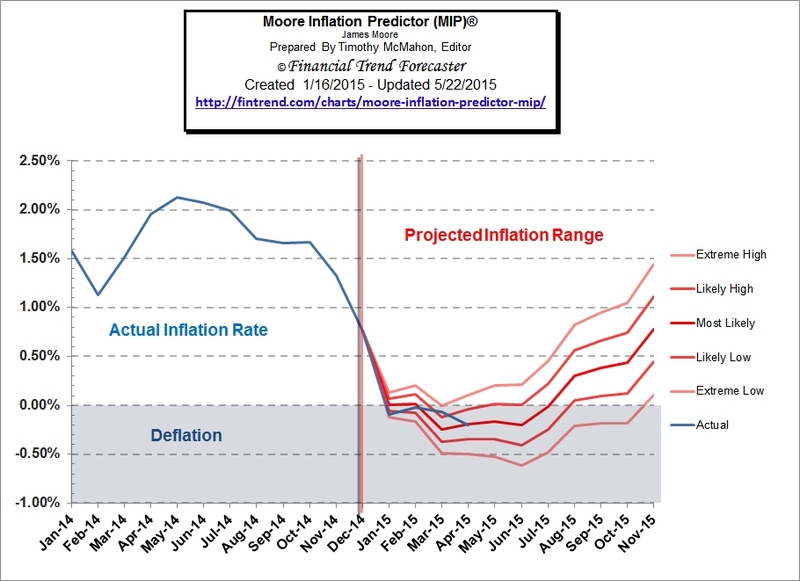 We hit the nail right on the head as inflation (or should I say deflation) came in at -0.09%. (Here is the chart with the reality line added). In our current MIP we are projecting a bit of ambivalence for May. It really could go either way. My guess is that it will be slightly up due to the recent run up in gasoline prices. The one interesting thing in this chart is the year end which appears to rebound sharply due to all the deflationary months from year-end 2014 falling out of the equation. But, of course, if they are replaced by equally deflationary months this year the rise won’t happen. 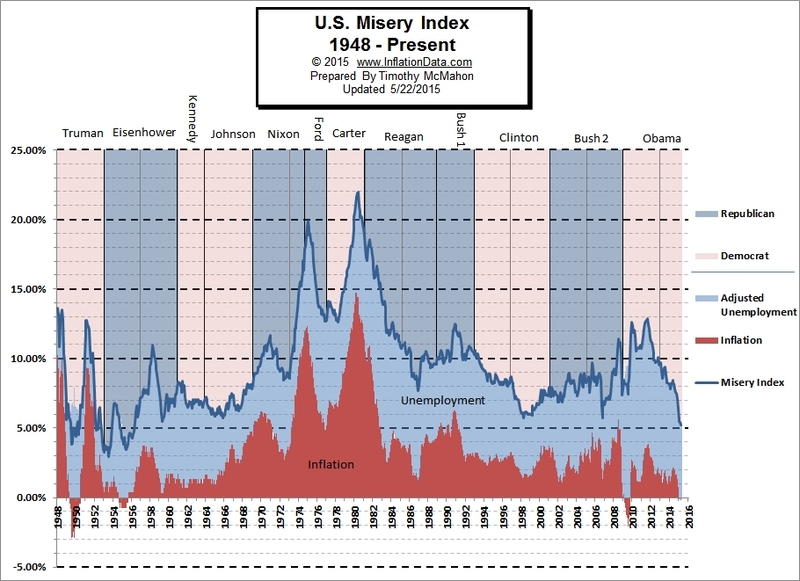 The misery index as of May 2015 (based on the most recent official government data for April 2015) is at 5.20% (5.4% unemployment and -0.20% inflation) down from a peak of 12.87% in both October and November 2011 which was pretty miserable.